A world of opportunity. Scenic is packed with innovation to help you make the most of every moment. Clever design has created beautiful proportions whilst maximising space to stay true to the “Multi-Purpose Vehicle” concept. Furthermore, innovations in modularity make Scenic a flexible vehicle to live with every day. Top that with the latest safety and in-car technology and Scenic is ready for what life will bring. 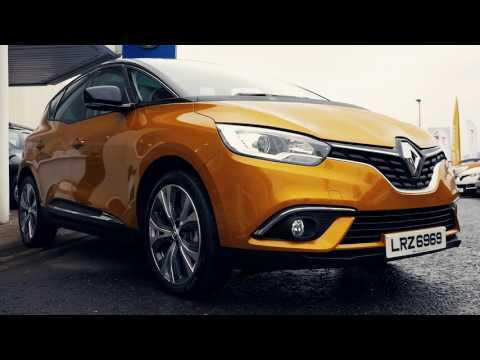 With its large 20” wheels, its plunging windscreen, its unprecedented bodywork lines and its lighting signatures front and back, the All-New Renault SCENIC has reinvented itself with the focus firmly on styling. A sliding console, a drawer in the front, shelves in the back... the handy ‘Easy Life’ storage features of the All-New Renault SCENIC make your life easier. Make the most of its modular layout. Create a flat floor in a flash thanks to the One-Touch control. Our engineers have fitted the All-New Renault SCENIC with all the latest technology. MULTI SENSE ensures driving comfort like never before. For your safety, lane departure warning, active emergency braking with pedestrian detection and tiredness detection alert are brought together for the first time on a Renault vehicle. The All-New Renault Scénic sets itself apart from the crowd through a number of state-of-the-art technologies, including active emergency braking with pedestrian detection as standard; a first for vehicles in its segment. To enquire or for more information please contact us at Charles Hurst Renault. Personal Contract Purchase (PCP) offer for Retail customers only. Not for Business Users. Representative 0% APR available on Scenic Dynamique Nav TCe 115 when registered and proposed for finance through RCI Financial Services Limited in conjunction with Renault UK, P.O. Box 495, Watford, WD17 1FJ. As the credit broker we may receive commission from the lender for referring you. This promotion cannot be used together with other manufacturers promotions and is subject to availability. Prices shown are for new vehicles registered and delivered while stocks last. All details are correct at time of publication and are subject to change without notice. Offer may be varied, withdrawn or extended at any time. Representative example is based on a total mileage of a 20,000 over the selected agreement.